Fans of the Outlander STARZ TV show are in for another several months of “droughtlander.” The final episode of season 4 has aired, leaving us waiting excitedly for the next season of adventures with Claire, Jamie and crew. 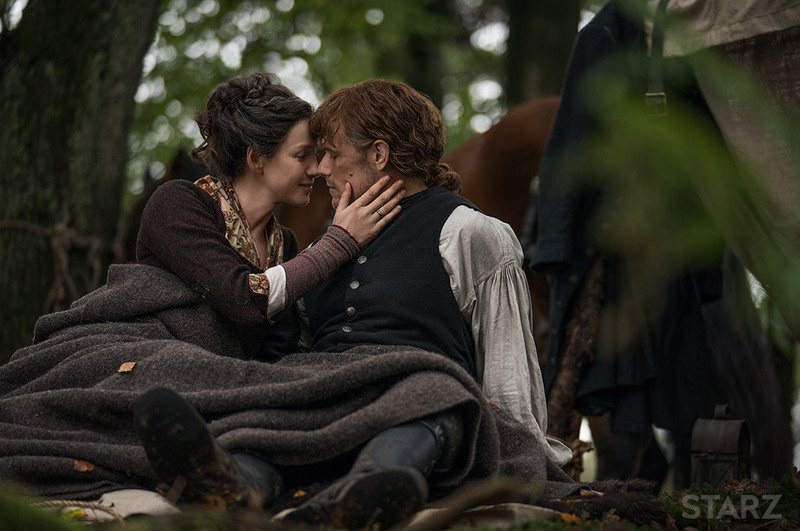 In case you haven’t read book 5, “The Fiery Cross,” don’t plan to read it, or it’s been awhile since you’ve read the book, here’s a summary with potential spoilers for season 5 of Outlander. As we’ve already seen in the Outlander TV series, writers have made drastic – and sometimes highly unpopular – changes compared to Diana Gabaldon’s books. This is likely to continue as they again compress an enormous book – 1,456 pages, in this case – into 13 episodes. That means we can’t count on everything that happens in the book appearing in the TV show. Nevertheless, here are some book highlights that seem likely to appear in season 5 of Outlander. Book 5, “The Fiery Cross,” starts off with a large Scottish gathering where Roger and Bree plan to marry and have their son Jeremiah (a.k.a. Jem or Jemmy) baptized. Fergus and Marsali also need to have their offspring baptized. 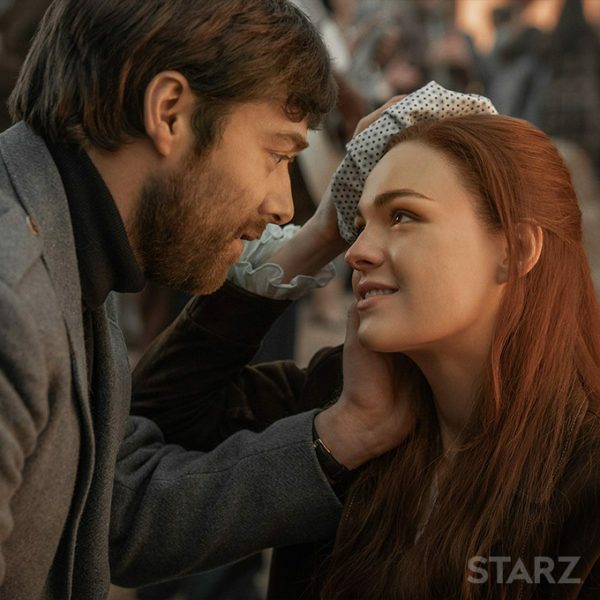 Naturally, things go awry (nothing goes as planned in Outlander-land), but eventually, Roger and Bree say their vows and children are successfully baptized. 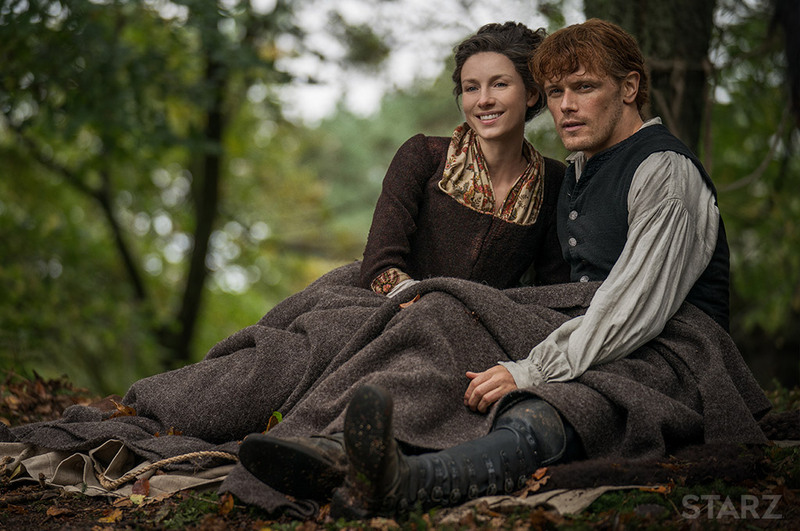 Jamie is supposed to grow a population on Fraser’s Ridge as a condition of his land grant. The gathering gives Jamie a chance to look for potential settlers for Fraser’s Ridge, preferably other former Jacobites he knew at Ardsmuir prison. If you recall, when the government closed Ardsmuir, all of the prisoners except Jamie were shipped to America as indentured servants. Due to Lord John Grey’s fondness for Jamie, he was able to save Jamie from transportation and instead place him as a groom with friends in England. As Jamie continues to find more tenants to populate Fraser’s Ridge, the book introduces so many new characters that it can get hard to keep track of them all. It’ll be interesting to see how many of “The Fiery Cross” book characters make it into the TV series. Most of these characters end up with significant story lines in book 5 or future Outlander books, so writers will need to tread carefully. Some folks might never appear, and many details about people’s histories might be left out. From the start of book 5 onward, Claire encounters numerous opportunities to use her healing skills. She also starts experimenting with creating her own 20th century medicines such as penicillin. In addition, she begins using the tools and journal of a mysterious Dr. Rawlings, whose medical kit has come into her hands. The medical kit includes a microscope, which revolutionizes Claire’s 18th century medical practice. Outlander author Diana Gabaldon has promised two more books (for a total of 10) in the Outlander series featuring Jamie and Claire Fraser. One of those remaining books might actually be released in 2019. I’ll be amazed if Roger doesn’t die in one of the remaining books. There, I’ve said it. After all the terrible things that have befallen him, it’s a wonder he doesn’t race to the nearest stone circle and head back to the 20th century where he belongs. If you think Roger had it bad in Outlander season 4 (based on book 4 of the Outlander series, Drums of Autumn), just wait until season 5. He’s very nearly killed, and would die if not for Claire (of course) arriving just in the nick of time to save his life. Despite surviving his very, very near death experience, Roger is badly injured and scarred, perhaps for life, both physically and mentally. Jamie and Claire’s daughter Brianna chafes under 18th century attitudes toward and expectations of women. Perhaps Claire has an easier time of it because she’s used to having to fight for everything. Bree comes from an era when women are starting to struggle for – and achieve – more rights. In the 18th century, she begins to feel that her only worth as a woman is her breeding potential. Furthermore, the possibility of dying during childbirth is an expected and accepted risk. There’s some talk of time travel in book 5, but nobody actually goes through the stones. Bree, Roger and Claire know that the Revolutionary War will soon bring death, destruction and danger to their doorstep. Claire, of course, won’t leave Jamie. Bree and Roger discover that it’s likely their son, Jemmy, can time travel, so they could return to the relative safety of the 20th century if they want. Stephen Bonnet remains a key villain throughout book 5 and will likely do so in season 5 of the TV show. The TV show producers certainly found the perfect actor to portray this sometimes charming psychopathic criminal, and he’ll be around to torment the Fraser clan for awhile. Jamie continues his quest to find and kill Bonnet, especially since the stakes have gone up. Bonnet finds out about a secret treasure buried at River Run. This results in a slave’s gruesome death and a precarious situation for Jamie’s Aunt Jocasta and her household. I never understood why Bree insisted on seeing Stephen Bonnet and telling him about the baby that might be his. Now, that’s coming back to haunt her. Bonnet thinks Jemmy is his son, and tries to get to him. This results in Bree seriously injuring Bonnet, but not killing him. The entire Murtagh story line is specific to the TV series. As you may know, in the books, Murtagh was killed at Culloden. The TV series writers seem to be using him as one way to differentiate the TV series from the books. Instead of having Jamie’s one-armed friend Duncan arrive and marry Aunt Jocasta, rebellious Murtagh comes along and causes problems where ever he goes. The end of season 4 saw Jamie assigned to take out Murtagh, his beloved godfather, since Murtagh is an outlaw and wanted man. In the book, the governor does order Jamie to form a militia, but their assignment is to go after a group of Regulators, not a particular individual. The militia is later disbanded before it actually does much of anything. Book readers may have noticed that the character Duncan Innes is totally missing from the TV show. But he’s not really missed. He’s a boring but necessary character in the books who marries Jocasta in what appears to be, at least initially, a simple business arrangement between two folks who like and respect each other. For the time period, it’s unrealistic for a woman to own and run a plantation on her own, let alone an elderly, blind woman. That’s the world they inhabit. Jocasta needs a husband. That topic hasn’t really been broached in the TV show yet, but to maintain time period realism, it’ll have to come up soon. I think that somehow, some way, Murtagh will end up marrying Jocasta. If it’s not Murtagh, then either Duncan will have to reappear out of nowhere, or some heretofore unknown character will need to arrive and sweep Jocasta off her feet. In the books, Duncan and Jocasta end up fleeing to Canada. As Loyalists to the British crown, they begin to feel unsafe and decide to leave. Should Jocasta marry Murtagh instead, they could flee to Canada because Murtagh needs to run to evade capture. What would Outlander be without characters surviving multiple grievous injuries? Jamie barely survives a rattlesnake bite in book 5. Roger survives yet another near certain death experience toward the end of the book, saved in the nick of time with the reappearance of an old friend. Jamie and Claire have settled into married life. They love each other passionately, but their relationship is no longer at center stage. In addition to their natural child, Bree, and her family, they have Fergus and Marsali and their growing brood. They also have a growing population of tenants in Fraser’s Ridge. Jamie and Claire disagree sometimes like any married couple, but in the end, they love each other, warts and all. Both Jamie and Claire have their idiosyncrasies. But after what each has been through, and what they’ve both given up in order to be together, anything else is just a lump in the oatmeal. 1st season was booring. but now I am waching all episodes. thanks for great article. keep writing. i always prefer to read from your blog. Stumbled upon this show while trying to fill a GOT void. Safe to say that void has been overfilled. I am very ecxited to know what is coming in season 5.